Dies R Us: A 3x3 Notecard! Vickie Y with you today sharing a small notecard using a fun die set from Penny Black. 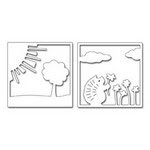 As I was creating this 3x3 notecard, I was reminded of making small lunchbox notes for my daughters while they were in grade school all the way through high school! I would put a notecard, sometimes in their lunchbox, sometimes it would get tucked inside a textbook or put into their backpack. Now that school has started, this die set would make creating a lunchbox notecard a cinch and will let someone know how special they are to you! To created the notecard, I first die cut this set then colored the images using Copic Markers. 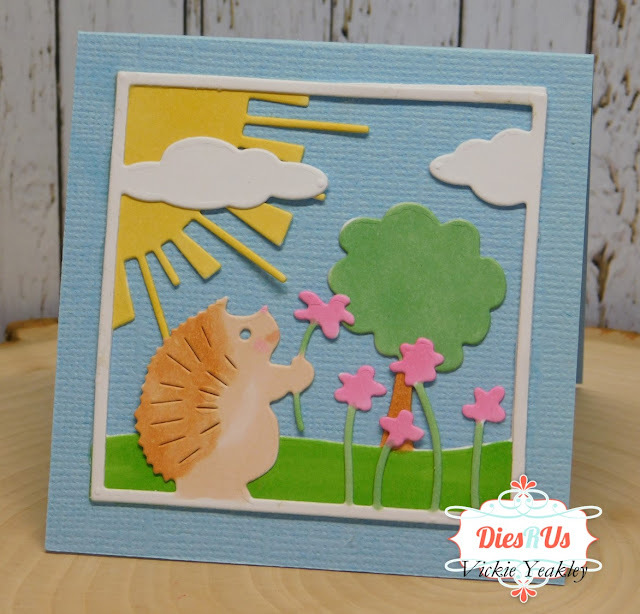 The colored die cuts are then layered with the hedgehog on top of the sun/tree die cut. I used liquid adhesive to adhere the dies together before adhering to the 3x3 top fold noteard. This was a fun card to create and brought back lots of fond memories! I love the lunch box idea and this note card. I was not into crafting when my children were little and taking lunches to school. But I out did it for my grand kids. Awe how sweet that you put little surprises in your girls lunch boxes & text books! Such a good Mom! Yes this would have made for a quick note card and brought big smiles to their faces! I know it brought a big smile to my face! Great job ... so cute! Adorable card! I love hedgehogs...so cute. Lunch box notes are the best. I used to do this for my girls and even my hubby! what a sweet little note! Vickie, this is so darling! What a sweet little hedgie!